iheartdinosx3 - Generation 1.1: Hello Violet! Okay so just wanted to give everyone a heads up! 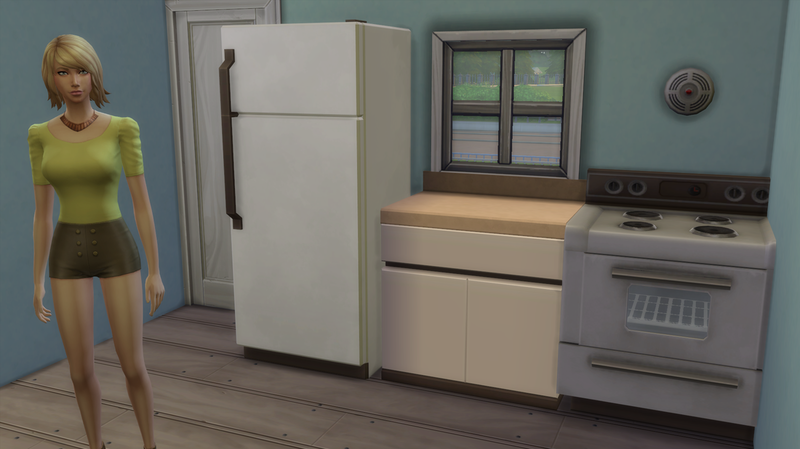 I started my legacy in Newcrest and I purchased the biggest lot which is only a 50 x 40 so I kinda bent the rules a little bit and ended up with a little extra cash on the side! Sorry! Meet Violet Belle, the founder of the legacy! If you haven't read her backstory click the button below. If you have, enjoy the first chapter! So first things first. It's time to take a look at our lovely little cottage! Here is the small kitchen, complete with fire alarm so no one catches on fire! 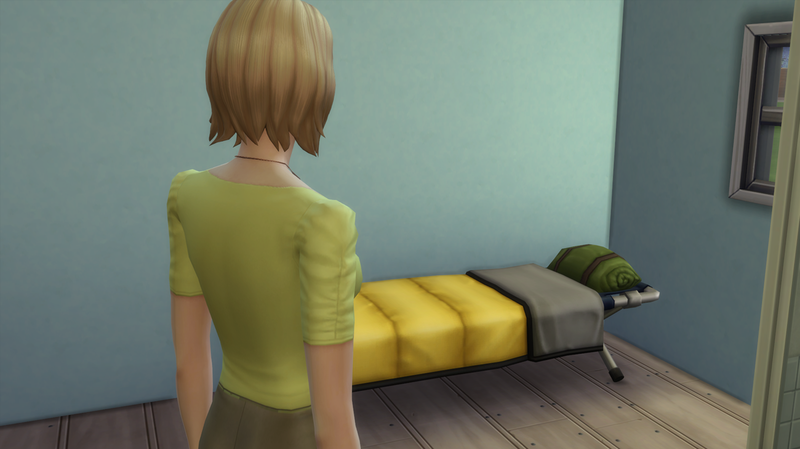 Here is the little camper bed I bought for you, thank god for that guy who founded Granite Falls and came up with all that camping gear stuff, because if he didn't you would be sleeping in a kid bed. And finally here is the bathroom! I know it's small but hey at least you don't have to go to the gym just to take a shower and use the bathroom! Violet: Well that's great and but where's the trash can? Violet: The trashcan? So I won't have a bunch of nasty plates sitting around from me cooking, or if the toilet breaks and those parts come out of it. Where am I supposed to put all that stuff? You did get me a trash can, right. I'LL FIGURE SOMETHING OUT OKAY?! So after all that was over and Violet finally stopped judging me, I made her look for jobs on her phone. So now she is part of the culinary career and is an official Assistant Dishwasher! I sent Violet to the park so she can start searching for a good husband but this was the first person I came across. Her name is Liberty Lee and she was staring at this chess piece intensely and I'm pretty sure she was talking to it to see if it knew the best move to make, although she wasn't playing with anyone. So I was like what the heck! Let's send Violet over there to make a friend and to give this girl some company! Violet: Hey uh..is it cool if I play with you? 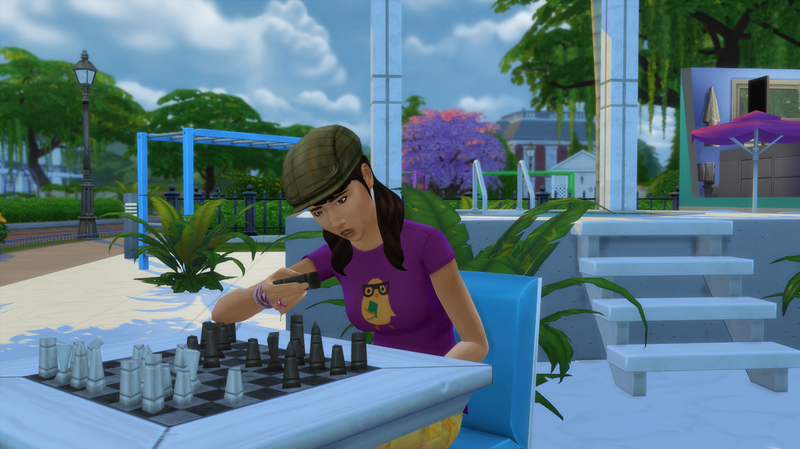 Unless you know your busy playing the chess pieces..
Liberty: Nah it's cool they weren't giving me good advice anyways. Surprisingly they hit it off really well and soon became friends! 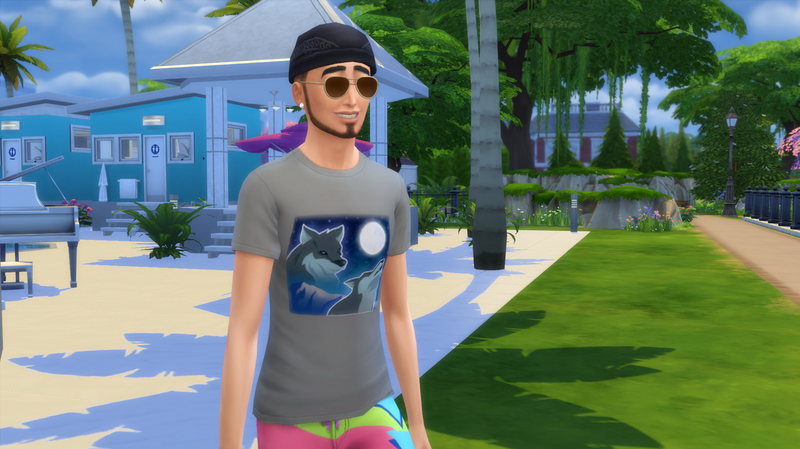 Violet got distracted though when she saw this guy in all his fashion disaster glory swimming in the pool. So she decided to go and talk to him and learned that his name is Camilo Knapp and that he works as a Community Gardener. They hit it off really well too, so I'm guessing everyone just really likes Violet or this is a one time thing. Violet: What's small purple and dangerous? Camilo: I don't know, what? Violet: A GRAPE WITH A GUN! Which in turn made Camilo laugh pretty hard, considering that was a really bad joke. All the sudden he just got out of the pool and left right in the middle of their conversation and me and Violet both were like, Okay bye? But obviously he had a good time because he had this big goofy grin on his face as he walked away! 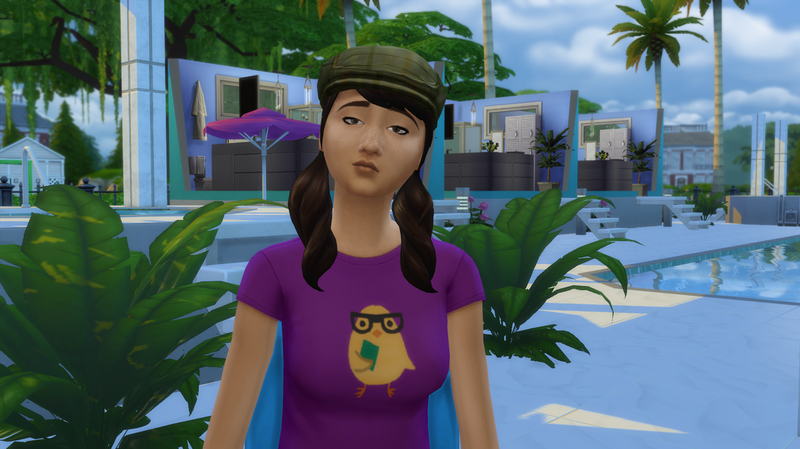 I was looking around the map for any more potential husbands and when I clicked back over to Violet this is what I managed to capture. She had gone skinny dipping in the hot tub and seemed pretty relaxed considering everyone could see EVERYTHING. Violet: Hey bud! I was wondering if you had a lady friend or something! Ya know, someone to keep your bed warm at night! Violet: Imma get dat booty. To get rid of all the awkwardness of asking that question Violet decided to tell a joke and judging by her face I'm pretty sure that she didn't even think the joke was funny. But Camilo laughed at it anyway! Either because he liked her or the joke was that bad. I had to get Violet back home so she could make food to keep up with the quota at work but before she left she gave Camilo a hug without me even telling her to! Everybody with me say "Awwwwww"! Also don't mind the little kid grinning and staring at them as he walks bye. 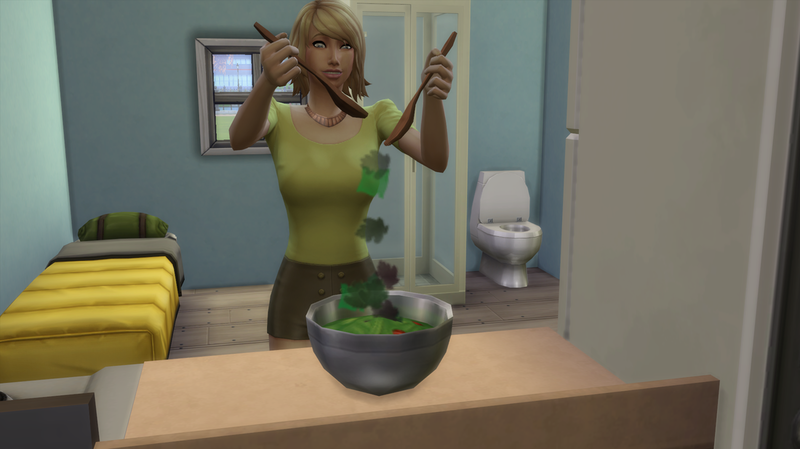 With Violet back home I decided that she was going to just make garden salads, because we only had $59 and she had to make 4 things for work. 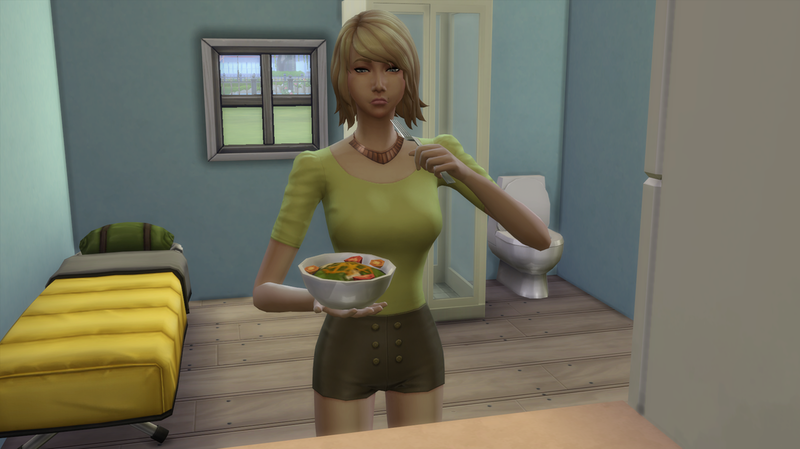 The next few of these pictures are me just documenting her first meal made! 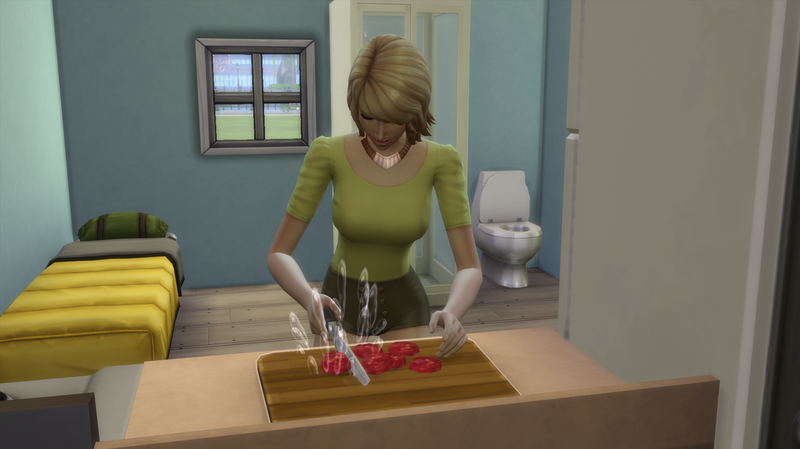 She did this weird thing where after she chopped up the tomatoes she stared at them and laughed. It was kinda creepy. Violet: Don't screw up. Don't screw up. Don't screw up. She ended up thinking it was pretty darn tasty! And finally to end this chapter I got Violet a unicorn trashcan! Violet: *mumbles* It's about time..
Chapter 1: Hope you enjoy!